The Islamic Revolution leader has said that the country needs to rely on its domestic production if it wants to see its economic problems solved. Leader of the Islamic Revolution Ayatollah Seyyed Ali Khamenei says domestic production holds the key to ironing out economic woes. “The key to solving economic problems is not in Lausanne, Geneva and New York,” said the Leader in a meeting with a large number of laborers. “If economic problems are to be solved, attention should be focused on domestic production,” the Leader noted. Ayatollah Khamenei underlined that the equipment needed by government organs must not be procured from abroad, urging the government to meet its needs through local suppliers if the appliances in demand are produced domestically. The Leader then stressed the need to walk the walk, and not merely talk the talk, when it comes to countering corruption. 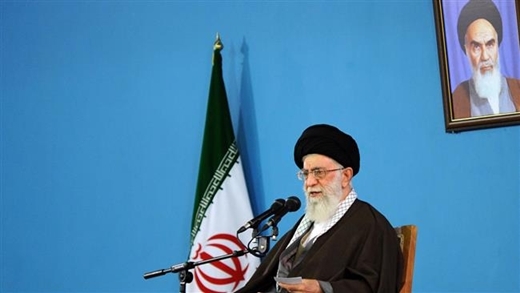 “We need to take action and stop corruption in the true sense of the word,” Ayatollah Khamenei underlined.